Atman is individual self and Brahman is the universal self. When we have deep understanding of Hinduism we will realize that there is only Brahman and Atman is unreal. So for a truly self-realized person there is no difference between the two. They are just names in the state of ignorance. 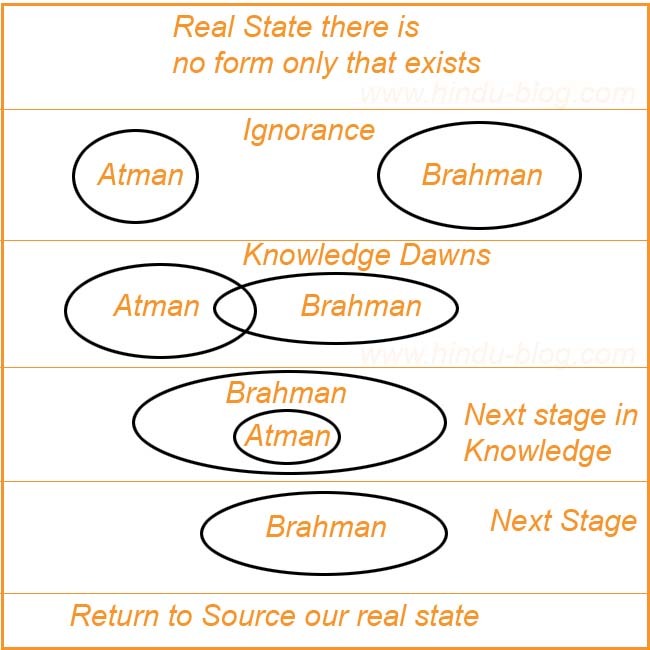 Realization of Atman and Brahman is the spiritual goal in Sanatana Dharma. Only this can lead to bliss. Scholarly approach and mere study of scriptures will not take us to our goal. This has to be realized. We have to realize that by individual effort. It is through individual self that we realize the universal self. Who am I? Am I the body or the seed. I cannot be the body. Then I must be the seed. But from where did the seed come from. What is the energy source behind the seed? It is such enquiry that helps us in shedding our ignorance. Mahavakyas in the Upanishads like Tat Tvam Asi (“That art Thou”) helps us in this journey. 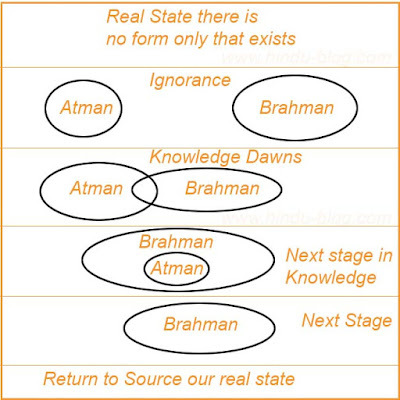 Sometimes in the Upanishads Atman is used instead of Brahman. Upanishads are the products of Rishis (please do not equate Vedic Rishis with modern day God Men and Saints – the Vedic Rishis were scientists) who had attained Self Realization. They had dropped the idea of individual self and universal self. For them there is only one. They both are the same. So we have the terms like Atman, Brahman, Satya, Jnana, Ananta, Amala, Anandamaya…they all are terms to help an individual in understanding that he/she is in the grip of ignorance. All animate and inanimate, including human beings, are drops of water in the ocean. Drops being the Atman and Ocean being the Brahman. The realization of the true self is a necessary criterion for understanding Brahman. When we have the wrong information regarding our true self, we will not be able to understand the universal self. We have been taught or we have come to believe that individual and god are two different entities. It is not true. Self purification through knowledge found in scriptures and then through self realizations we need to remove this wrong teaching which is responsible for our suffering here on earth. Pure ecstasy is possible only through the knowledge of Brahman. If we consider the individual self to be different from the universal self then are under the control of Maya or illusion. We constantly suffer. Throw out the notion of a God sitting somewhere up in the sky controlling all activities in the universe. When we are able to see a single thread running through all animate and inanimate we have dropped the individual self and understood the universal self. But do not stop there. We still have a problem because we still think universal self is there outside. No it is not outside. We have to reach a state where there should be no realization. There is nothing to be realized. No words. No thoughts. Just That. This is Moksha or Liberation and it has to be attained here and now. All names and forms only exist as long as we are in the grip of individual self. When this notion is destroyed, we reach a state without form and name and that is the state of Brahman. The recognition of Pure Being as one's Self and the Self of the universe and of all beings is the supreme and ultimate truth, transcending all other levels of doctrine without denying their truth on their own plane. This is the doctrine of Advaita, non-Duality, taught by the ancient Rishis and pre-eminently by Shankaracharya. It is the simplest as well as the most profound, being the ultimate truth beyond all the complexities of cosmology.